The simplicity and convenience meet in one design in this 36” Bathroom Vanity. Easy to clean Acrylic Resin basin gives plenty of countertop space. Two self-closing drawers added for immediate storage. 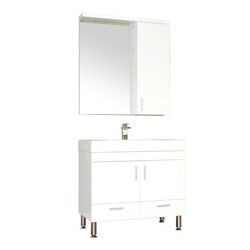 A Medicine Cabinet with matching finish may finalize the look and an optional side cabinet may serve as a perfect solution for enriching any bathroom-remodeling project.